I am a professor in the Department of Computer Science and Engineering at Seoul National University. My research interests are in the areas of computer graphics, animation, biomechanics, and robotics. I am particularly interested in developing new ways of understanding, representing, planning, and simulating human and animal movements. This involves full-body motion analysis and synthesis, biped control and simulation, clinical gait analysis, motion capture, motion planning, data-driven and physically based techniques, interactive avatar control, crowd simulation, and controller design. I co-chaired ACM/EG Symposium on Computer Animation (SCA) in 2012 and ACM SIGGRAPH conference on Motion, Interaction and Games (MIG) in 2018. I also served on numerous program committees, including ACM SIGGRAPH, ACM SIGGRAPH Asia, Eurographics, ACM/EG Symposium on Computer Animation, Pacific Graphics, CGI, and CASA. I am currently an associate editor of IEEE Transactions on Visualization and Computer Graphics. I am leading SNU Movement Research Lab. Postdotoral research positions are available. Please contact me if you are interested in. Abstract: The animation and simulation of human/animal behavior is an important issue in the context of computer animation, games, robotics, and virtual environments. 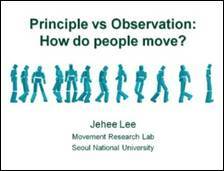 The study on human movements and animal locomotion has revealed various principles based on physics, biomechanics, physiology, and psychology. In this talk, we will discuss the design of a physically based controller that simulates the flapping behavior of a bird in flight. We recorded the motion of doves and parrots using marker-based optical motion capture and high-speed video cameras. The bird flight data thus acquired allow us to parameterize natural wingbeat cycles and provide the simulated bird with reference trajectories to track in physics simulation. Our controller simulates articulated rigid bodies of a bird’s skeleton and deformable feathers to reproduce the aerodynamics of bird flight. Motion capture from live birds is not as easy as human motion capture because of the lack of cooperation from subjects. Therefore, the flight data we could acquire were limited. We developed a new method to learn wingbeat controllers even from sparse, biased observations of real bird flight. Our simulated bird imitates life-like flapping of a flying bird while actively maintaining its balance. The bird flight is interactively controllable and resilient to external disturbances. Abstract: The animation and simulation of human behavior is an important issue in the context of computer animation, games, robotics, and virtual environments. The study on human movements has revealed various principles based on physics, biomechanics, physiology, and psychology. Many of existing animation techniques rely on those principles, which may be described as mathematical equations, algorithms, or procedures. Another stream of research, called data-driven animation, made use of human motion data captured from live actors. The research on data-driven animation has developed a variety of techniques to edit, manipulate, segment and splice motion capture clips. The current trend of animation research is to combine these two approaches to complement each other. Over the past few years, we have explored several methods that addressed the problem of simulating human behaviors in virtual environments. Each solution relies on different principles of human movements and motion data captured at different scales. We found that principles and observed data can interact with each other in several ways. Sometimes, motion data drive physically-simulated bipeds that walk, turn, and spin. Sometimes, physics principles guide interactive motion editing to make a canned jump higher/wider and a spin longer. 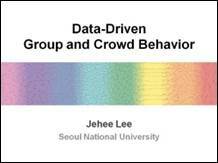 The group/crowd behavior can be captured from video, analyzed, interpolated, and re-synthesized to create a larger group/crowd of virtual humans for an extended period of time. Sometimes, simply adding more flexibility to motion data allows our animated characters to navigate highly-constrained, cluttered environments interactively. 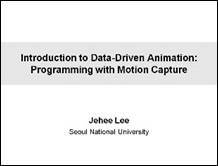 Abstract: Data-driven animation using motion capture data has become a standard practice in character animation. A number of techniques have been developed to add flexibility on captured human motion data by editing joint trajectories, warping motion paths, blending a family of parameterized motions, splicing motion segments, and adapting motion to new characters and environments. Even with the abundance of motion capture data and the popularity of data-driven animation techniques, programming with motion capture data is still not easy. A single clip of motion data encompasses a lot of heterogeneous information including joint angles, the position and orientation of the skeletal root, their temporal trajectories, and a number of coordinate systems. Due to this complexity, even simple operations on motion data, such as linear interpolation, are rarely described as succinct mathematical equations in articles. This course provides not only a solid mathematical background but also a practical guide to programming with motion capture data. The course will begin with the brief review of affine geometry and coordinate-invariant (conventionally called coordinate-free) geometric programming, which will generalize incrementally to deal with three-dimensional rotations/orientations, the poses of an articulated figure, and full-body motion data. It will lead to identifying a collection of coordinate-invariant operations on full-body motion data and their object-oriented implementation. 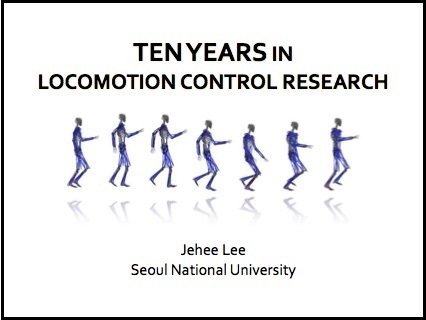 Finally, we will discuss the practical use of our programming framework in a variety of contexts ranging from data-driven manipulation/interpolation to state-of-the-art biped locomotion control. 컴퓨터공학부에 진학하길 희망하는 고등학생입니다. 컴퓨터공학이란 무엇인가요? 동아사이언스에서 제작한 "공대가 좋아" 프로그램 컴퓨터공학부 편에 제 나름의 생각을 설명했습니다 (Link). 비디오에서 설명하지 못한 내용을 첨언하자면, 컴퓨터공학을 공부하길 원하는 학생들을 위해서 "괴델, 에셔, 바하"라는 책을 추천했습니다. 이 책은 컴퓨터와 음악과 미술을 넘나들며 컴퓨터과학 및 공학에 대한 흥미를 끌 수 있는 훌륭한 교양서입니다. 다만, 오래 전에 국내에 소개된 번역본이 수준 이하여서 원본의 내용을 이해할 수 없을 정도입니다. 누군가 다시 한번 번역본을 내준다면 좋겠지만, 현재로서는 번역본을 추천할 수는 없을 것 같습니다. 원본은 내용이 어렵지 않아서 고등학생이나 학부생들도 읽을 수 있습니다. 학부생인데 연구실 인턴을 할 수 있을까요? 연구실에 남는 자리가 있으면 인턴을 받습니다. 대학원생이 많을 때는 자리가 부족한 경우도 있습니다. 그럴 때는 자리가 빌 때까지 기다려야 합니다. 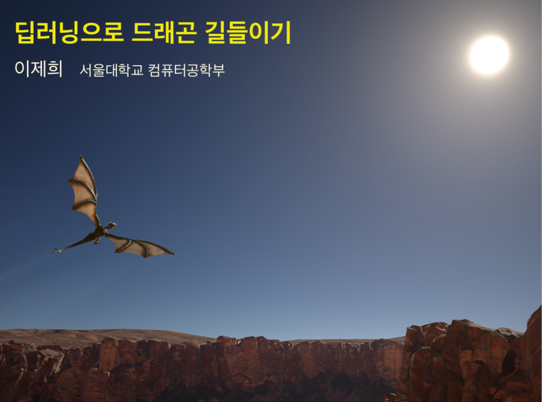 연구실에 인턴으로 있다고 해서 대학원 진학 시에 우리 연구실에 오는 것을 보장하지 않습니다. 학부생 인턴과 대학원 진학은 별개 입니다. 유학을 생각 중인데 추천서를 받을 수 있을까요? 내 수업을 들은 적이 있던가, 혹은 나와 같이 일을 한 경험이 있던가, 혹은 어떤 이유에서든 내가 알만한 이유가 있는 학생들의 추천서는 거절하지 않습니다. 다만, 추천서에는 내가 아는 내용만 씁니다. 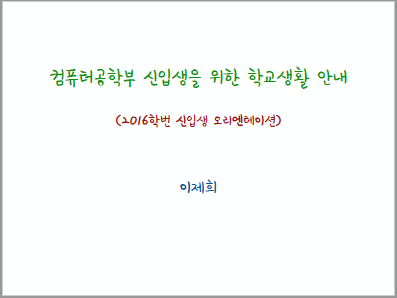 수업을 통해서 보여준 능력, 나와 같이 한 일을 통해서 보여준 모습, 객관적인 자료를 통해 설명할 수 있는 내용은 충실히 적지만, 내가 알지 못하거나 확인할 수 없는 내용은 적지 않습니다. 추천서는 가능한 객관적인 시각에서 내가 아는 학생의 모습을 정확히 설명하려고 노력합니다. 대학원에 진학해서 연구실에 지원하고 싶습니다. TO는 있나요? 연구실 지원자와 정원은 매년 달라서 몇명이나 우리 연구실에 지원할지 몇명이나 뽑게 될지 미리 알기 어렵습니다. 일단 서울대학교 컴퓨터공학부 석사 혹은 석박사과정에 지원해서 필기시험과 면접시험을 통과하고 나면 개별 교수들과의 심층 면접 과정에서 저와 면담할 기회가 생길 것입니다. 그 이후에 연구실에 올 수 있을지에 대해 얘기할 수 있습니다. 박사과정으로 진학을 원하는 경우는 필히 입시 과정에 들어가기 전에 별도로 면담을 해야 합니다. 우리 연구실에 지원하기 위해서는 어떤 준비를 해야 하나요? 대학원에서 연구실을 선택하는 문제는 학생 개개인의 인생에서 적지 않은 시간을 투자하는 중요한 결정입니다. 마찮가지로 교수에게 있어서도 짧으면 2년, 길면 6~7년 정도의 긴 시간을 함께 할 사람을 뽑는 중요한 결정입니다. 면담 과정을 통해서 지원자가 어떤 능력을 갖추고 있는지, 앞으로 어떤 미래를 그리고 있는지, 어떤 열정을 가지고 있는지 신중히 판단하고 결정합니다. 다만, 모든 학생들은 제각기 다른 능력과 열정, 미래를 가지고 있기 때문에 우리가 원하는 인재상을 간단한 말로 표현하기는 어렵습니다. 컴퓨터 관련 학과가 아닌 타전공 학생도 뽑나요? 뽑습니다. 이미 다양한 전공의 학생들이 연구실에서 공부하고 있습니다. 연구실 지원자에게 어떤 능력을 기대합니까? 학부 수준의 컴퓨터공학 기본 지식을 갖추고 있기 바랍니다. 특히, 프로그래밍 능력은 반드시 필요합니다. 수학이나 물리학을 잘 하면 좋습니다. 수학이나 물리학에 능통하지 않더라도 최소한 흥미를 가지고 있고 피하지 않아야 합니다. 말하고, 글을 쓰는 능력도 필요합니다. 팀을 리드하는 리더쉽도 필요합니다. 쓰다보니 다재다능하기를 원하는데 실제로 대학원 입학 시점에 이 모든 능력을 갖춘 지원자는 찾아보기 어렵습니다. 아마도 일부 능력은 미리 갖추고 있고, 일부는 진학한 이후에 키우리라 생각합니다. My kids, Sungho and Eunje, in motion capture in 2005.